MSC Software and e-Xstream engineering have released Digimat-RP/Moldex3D. Image courtesy of MSC Software. Composites are tricky. Unless the user understands the flow of mold material and how it affects fiber orientation, weak points and structural inconsistency can become a reality. To address this issue, MSC Software and e-Xstream engineering have released Digimat-RP/Moldex3D. 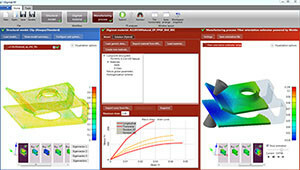 This CAE software is able to execute injection molding simulations within the Digimat-RP platform. By integrating Moldex3D into Digimat-RP, OEMs have another tool capable of assessing the fiber orientations of their injection-molded composite parts. Digimat also gives these users the ability to perform nonlinear analysis of the reinforced plastics using micromechanical material models. The injection molding simulations are performed using a CFD analysis. The software can predict the orientation of the fibers through its understanding of the injection flow pattern. This information can then be passed on to FEA analysis for a better assessment of the strength of the part. These fiber orientation assessments are designed to be relatively automated when it comes to meshing and solving the simulation. MSC explains that with minimal input, an engineer can have a better understanding of the strength of a part. “The design of reinforced plastic parts is traditionally based on a ‘black metal’ approach where the plastic behavior is highly approximated resulting in over-designed/too heavy parts," said Dr. Roger Assaker, CEO of e-Xstream engineering. "This is due to the lack of process information and efficient tools enabling the structural engineers to account for the actual material behavior in the early design stages. This is today solved with Digimat-RP in general and with the integration of Moldex3D within Digimat-RP." Though other fiber orientation CAE software exists (see this previous article) the interesting thing about the Digimat-RP/Moldex3D development is the merger of the products and the focus on automation. The automation of the product follows an industry trend to democratize simulation, whereas the merger of the software follows the multiphysics trend. The idea is to bring more complexity to the simulation but to keep that complexity under the hood so that more engineers will be able to benefit from the software. As a result, Digimat-RP/Moldex3D might occupy a niche in the early design phase of composite products. Do you occupy that niche? Will the integration of Digimat-RP/Moldex3D be helpful? Comment below.